The Swedish striker came on as a 71st-minute substitute for his Galaxy debut on March 31 against Los Angeles FC. It took Ibrahimovic just six minutes to get on the scoresheet with a remarkable strike from 40 yards – his first-ever strike for the club. The former Manchester United star then capped off a brilliant debut at the StubHub Center by heading in a stoppage-time winner to complete a comeback 4-3 win for Galaxy. 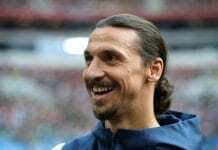 Now the MLS announced on their website that Ibrahimovic’s first strike against LAFC has won him the AT&T Goal of the Year – as voted by fans. Ibrahimovic joins the likes of Obafemi Martins and Landon Donovan in winning the Goal of the Year prize. The Swede also won the 2018 MLS Newcomer of the Year award on Monday after managing 22 goals and seven assists in 26 games for Galaxy.